Connemara Marble, aptly named as it is found nowhere else in the world save for this remote area of western Ireland. Quarries nestled in the Twelve Bens mountains of Connemara are the source of the marble, valued as a trade good since the days of yore, as well as modern times. 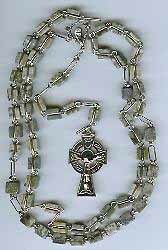 This rosary, about 36 inches in total length and typical of the Irish Catholic variety, is a full five decades in size, and the marble beads are double-linked for extra strength and durability with its Celtic cross. The Jordan River is a river in Southwest Asia flowing through the Jordan Rift Valley into the Dead Sea. It arises from springs at the base of Mount Hermon. One spring forms the stream Nahal Senir, the second (Banaias at Caesarea Philippi) forms the stream Naahal Hermon, the third forms the stream Nahal Dan, all three of which merge to form the Jordan. The Jordan River is the traditional site of the baptism of Jesus by John the Baptist. An Eastern Orthodox shrine near Qasir al-Yahud on the West Bank is generally believed to mark the exact spot. In the New Testament the baptism of Jesus is covered in Mark 1:9-11, Matthew 3:13-17, Luke 3:21-Luke 3:22, and John 1:29-34. The basic outline in all three synoptics Gospels is the same. They all begin by introducing the figure of John the Baptist and describing his preaching and his ritual of baptism. Jesus comes to the Jordan River and is there baptized, and after the baptism occurs the heavens open and God pronounces that Jesus is his son. Only after this moment Jesus' ministry begins. This glass charm is filled with water from the Jordan River, and capped with a gold-plated cross, the symbol of the Christian faith. The glass vial is about the size of a dime. The National Marian Shrine of Ireland, the Knock Shrine is located in County Mayo on the West Coast of Ireland. The fifteen witnesses watched the Apparition in pouring rain for two hours, reciting the Rosary. Although the witnesses standing before the gable were drenched, no rain fell in the direction of the gable. They felt the ground carefully with their hands and it was perfectly dry as was the gable itself. The personal pilgrimage of Pope John Paul II in 1979, commemorating the centenary of the apparition, inspired an even greater devotion to the Shrine and endorsed the indelible seal of Vatican approval. Mother Teresa of Calcutta visited the Shrine in June of 1993. One and a half million pilgrims visit the Shrine annually. (Text source: http://www.knock-shrine.ie/). This is a bottle of water collected at the Knock Shrine in October of 2005. 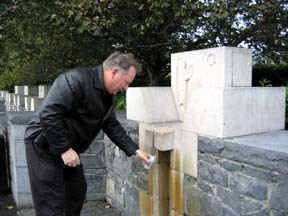 Click here to see a photo of the bottle being filled at one of the numerous water fonts at Knock. St. Therese of Lisieux was 24 years old when she died on September 30, 1897, she never went on a mission, founded a religious order, or performed great works. Instead, her road to sainthood began when, at the age of 9, she saw the Virgin Mary and was cured of a life threatening fever. By the time she reached the age of eleven she had developed a habit of mental prayer. Later, she began to make small sacrifices because "the only way I can prove my love is by scattering flowers and these flowers are every little sacrifice, every glance and word, and the doing of the least actions for love." St. Therese of Lisieux was canonized in 1925 and Pope John Paul II declared her a doctor of the Church, with the relics at his side, on October 19, 1997. She is the patroness of florists, the missions and of France. 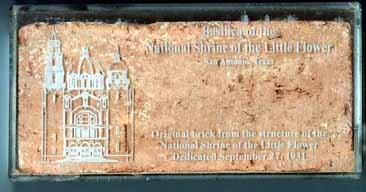 The National Shrine of the Little Flower located in San Antonio has received one of the highest papal honors a church can receive: the title of "minor basilica." This honorary title, conferred by the Holy See, ranks the Shrine of Little Therese among the other minor basilicas located throughout the world such as the Basilica of Fatima, Lourdes, Our Lady of Guadalupe and St. Anne de Beaupre. The elevation of the Shrine to basilica status has given many Catholics in the United States and throughout the world the opportunity to receive, at the shrine, many graces and blessings. After over two years of meetings and investigations among ecclesiastical authorities, both in the United States and in Rome, the Shrine received this honor on the 27th of August 1998, from Pope John Paul II.